Games with what you could call celebrity endorsements are not unknown. But Richard Dawkins: Evolution is something of a different breed. Professor Dawkins is one of the world’s foremost scientists as well as perhaps its greatest populariser of science - fitting into a noble tradition of thinkers who went the extra mile to explain their discoveries for the general public. This article originally appeared on Kotaku UK. Read their preview of Richard Dawkins: Evolution and BritSoft Focus feature on its director Gordon Ross. 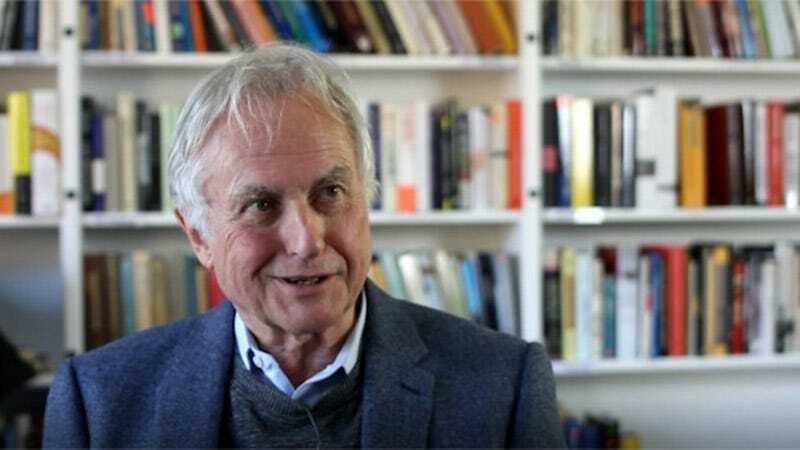 Dawkins has published countless books over the years, including the likes of The Selfish Gene, Unweaving the Rainbow, Climbing Mount Improbable, and perhaps most infamously The God Delusion, which takes off like a rocket to rain hellfire on what religious thinking inflicts upon society. The most obvious starting point, then, is why such an eminent thinker is getting involved with videogames. As a long-term fan of Dawkins’ work, I stretch perhaps a little too far here and ask if he sees the game as something of an ‘extended phenotype’ of his own - one of his books is named The Extended Phenotype, and posits that any effect a gene has on its environment should be considered as part of its phenotype. I should have realised, of course, I was talking to a real scientist. Getting back to the specific concept behind this game, what is it about the medium that interests Dawkins? “So if you’ve seen them, that was I think quite a successful attempt to use a computer game to explain something about evolution,” Dawkins continues. “It was explaining the power of selection. In that case it was artificial selection, where the human sitting in front of the computer screen chooses which offspring of a parent to breed from, and the offspring then moves to the centre of the screen and becomes the parent of the next generation, which is a matrix of mutant children, and then you choose which of those mutant children to breed from, and so on and so on and so on. The point being that here Dawkins is using software alongside his own arguments, in order to make the player prove his point - putting them in the position of the watchmaker. I ask Dawkins about previous games that, to lesser and greater extents, have taken some sort of evolutionary theme - the example I use is Spore. Dawkins knows Will Wright, and remembers speaking to him about the game during its development, but unfortunately can’t recall the specifics. I suggest that Spore didn’t really have much to do with evolution in the end, and ask about the principles underlying this new game’s design. It’s all well and good to say you’ll make a game about evolution, but what are the foundations, the rules? Given the game will have a big population and players can watch some sort of natural selection play out over that, I wonder how it operates in terms of timescale. Natural selection can take place over a couple of decades or alternatively over millennia. How do you decide how quickly you see those impacts, because the game has to be fun, without losing track of the purpose? “It’s a very shrewd question [...] because evolution is an incredibly slow process and would be extremely boring if you had to wait for that sort of length of time,” says Dawkins. “But occasionally it does go very very fast. I mean, some of the work on the Galapagos Islands on Darwin’s finches shows that it can go extremely fast. And in Lake Victoria the cichlid fishes, I mean, we know that Lake Victoria is only a matter of tens of thousands of years old, not millions of years old, so all the evolution of the cichlid fishes in Lake Victoria has taken place in a matter of tens of thousands of years, and that’s about 450 separate species all evolved from one ancestor in that period. How do I actually observe this evolution? The word ‘oversight’ comes up and, I have to ask the question, is Richard Dawkins making a god game? The notion gets a belly laugh but I do wonder whether, as an expert on the topic, Dawkins is making sure some of his favourite examples are included. To change gear, I often feel that educational videogames don’t really understand the form - often there’s this sense that it’s almost treated like a textbook, rather than an interactive piece of software. I ask what Dawkins see as the strengths of an interactive medium in terms of communicating ideas. Dawkins later returns to this topic to say that his attitude largely comes from finding that, when he created the Biomorphs program, it taught him a few things. “I think that remark of Michael Gove was possibly the single-most deplorable thing that came out of the whole Brexit campaign,” says Dawkins. “In a way even worse than the lie about the, whatever it was, £350 million a week that was on the bus. To say you mistrust experts, ‘We’ve had enough of experts, you are the experts here,’ the point has been made often enough almost to become a cliché that if you want to have your appendix out you go to an expert surgeon, you don’t go to some amateur. If you’re going to get in a plane, you want a pilot who knows how to fly a plane and is an expert, a real expert, a professional. To say, ‘We’ve had enough of experts,’ is a truly shocking thing to say. “And, I mean, I’d put it more strongly by saying that Brexit, the idea of leaving the European Union, is such a complicated matter, such a complicated economic, political, historical question with ramifications that hit everything in all sorts of ways, this is a matter for people with a PhD in economics. It’s not a matter for people like me. I should never have been given the vote on Brexit. Unless you’ve got a PhD in economics, nor should you. Dawkins has two foundations, one in the UK and one in the USA. When he looks at America now, and the recent election of Trump precipitating what one might call a war on science, how does he feel scientists should be reacting? And so we arrive back to Richard Dawkins: Evolution. I once wrote a history of videogames and, within that, gave an entire chapter over to The Oregon Trail - an educational game from the 1970s, designed by a teacher, that eventually proved wildly successful in the US education system. It strikes me even now as one of the most important games ever, not least as a proof-of-concept for communicating ideas to children. Is that where we’re going with something like this? “I am delighted with that suggestion,” says Dawkins. “I’m ashamed to admit it hadn’t really occurred to me that it would be good to put this to TIES. TIES is the Teacher Institute for Evolutionary Science, which was founded by the US Richard Dawkins Foundation for Reason and Science. It’s run by a splendid middle-school teacher called Bertha Vasquez, who’s a brilliant teacher and who’s running courses for middle-school science teachers to teach them how to teach evolution. So they’re not courses for children. They’re courses for teachers to pass on the skills and knowledge that Bertha has, and the resources, and I could well imagine that Gordy’s game would be a brilliant resource for her to use. “I didn’t know about The Oregon Trail. It sounds a little bit like something called The Ancestor’s Trail, which is a pun on my own book The Ancestor’s Tale, which is a book that I wrote jointly with Yan Wong, and it’s in the form of a pilgrimage. It’s not a pilgrimage to a place. It’s a pilgrimage to a time. It’s a pilgrimage to the origin of life. And we cast it actually as a kind of Chaucerian pilgrimage, with pilgrims marching from the present to the past, and the human pilgrim is being joined successively by first of all the chimpanzee pilgrims. We’re marching backwards in time, and when we get to six million years ago we’re joined by the chimpanzee pilgrims, and then when they get to eight million years ago we’re joined by the gorilla pilgrims, and then at twelve million years ago we’re joined by the orangutan pilgrims, and so on back to the origin of life. I finish by asking what Dawkins hopes, when the game is done, what people will take away from it. What would make this a successful project? Rich Stanton is acting editor of Kotaku UK.